Fashionably designed using mid-range materials and high-end parts, the Samsung Notebook 7 Spin is an obvious choice to quell MacBook Pro envy. This laptop has the "wow" factor that bargain hunters with taste desire. You're currently reading our review of the 2017 version of this laptop. If you want to know about the latest model, read our 2018 Samsung Notebook 7 Spin review now. If the Notebook 7 Spin is any indication – which it is – Samsung has come a long way in the laptop space these past few years. It’s actually hard to believe that, at one time, the company known for making one of the most widely used phones in the world was releasing cosmetically interesting clamshells hindered by shoddy components. The worst part is that many of Samsung’s Windows devices were priced like high-end machines, so to say their sleek, albeit hollow, designs would justify such lofty price tags. Obviously, this behavior was met with harsh reactions from critics like ourselves, but all of that changed in 2016 with the launch of the Samsung Notebook 7 Spin. While it’s not an Ultrabook, mind you, the 15.6-inch Samsung Notebook 7 Spin is a fantastic, mid-range 2-in-1 laptop. That means that, thanks to a hinge that flips 360 degrees inside out, this machine can be used as a sort of makeshift Windows tablet. In that way, it’s similar to Microsoft’s Surface devices, only its screen can’t be removed from the keyboard base. What’s prolific about the Samsung Notebook 7 Spin is that, although it feels premium to the touch, it starts at the modest price of $899 (about £681, AU$1,206). 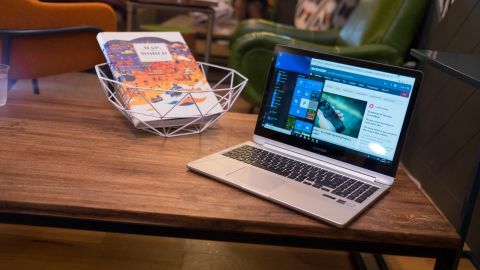 Better yet, Sammy has finally mitigated concerns over its integration of low-end parts, fueling the Notebook 7 Spin with heaps of memory and storage as well as a discrete Nvidia graphics chip. Oh, and let’s not forget that gorgeous HDR display, even if it is only 1080p. Yeah, we'd say Samsung accomplished its mission. After all, there’s a reason the Notebook 7 Spin made its way onto our best laptop list. That's in no small part thanks to how Samsung employed a serious design sense in molding the Notebook 7 Spin shell while making use of less-than-high-end materials. Not much has changed about this iteration from the previous in terms of design ID, though. The same subdued, chrome Samsung logo sits flush left on the laptop's brushed aluminum lid, and the aluminum keyboard deck feels just as refreshingly cool to the touch as it has for at least one or two generations now. However, the bottom half of the silver-colored chassis is comprised of a soft touch plastic that's both cheaper and better prevents slipping. However, back to what's sitting on upper half. Making liberal use of the room that its 15-inch size affords it, unlike some key competitors, Samsung laid out a full set of curved, backlit black keys – including a number pad. The keys offer a hearty punch when pressed and released, and were effortless to adjust to over the course of our review. The spacious, glass trackpad is centered with the space bar, which we wish was centered with the device instead, but otherwise performs just fine with single and- multi-touch gestures. And if you just want to touch the screen you can do that or even convert it into an oversized tablet. This editor is generally a curmudgeon when it comes to convertible hybrids, but we don't mind it here as an add-in feature, since the hinge is so strong and sturdy it's barely noticeable. That said, using this thing as a tablet is just plain silly, even with its neat, curved lip above and below its hinge available to help with grip. Simply put, it's just too heavy and bulky for that kind of use. The tent-like mode is excellent for bedridden movie binges, though. What you have here is a laptop designed to be attractive and effective without being ostentatiously expensive, and the Notebook 7 Spin's design simply exudes that quality. That said, it is rather hefty.